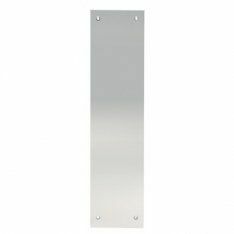 Here at Ironmongery Experts, we have a range of strong and durable Push plates. It is vital to have the necessary protection over doors which are constantly being opened and closed. The wooden parts of doors that close automatically will garner wear and tear over time. Our products are the perfect way to ensure that your doors remain polished and clean cut. Doors also need to be secured properly at all times. We have a range of Cabin Hooks available to give you a traditional locking mechanism. Outside structures such as garden sheds and greenhouses need to have a practical method to open and close doors to ensure that outside appliances and pieces of summer furniture are always safe. To add more class to your doorway, check out our selection of Escutcheons. These high-quality designs are the perfect way to protect your key hole and add more class to your door way. All our products are made for long lasting endurance and come in various finishes, such Steel and Nickel. Doors for inside use can have some much-needed vibrancy with any of our fun Cupboard Knobs and Handles. These are perfect way to add character and life to any indoor appliance or hardware. Our designs are quirky and dynamic with strong child appeal. For doors that need to have precautionary indication, check out our range of Indicator Bolts. These are ideal for toilets either at home or work. We have conventional worded designs such as the Polished Brass Vacant/Engaged Indicator Bolt and coloured models like the SAA Red/Green Indicator Bolt. To keep your work place or household constantly clean, we have a range of Ventilation products. It is vitally important to maintain a clean home and workplace environment which can impact productivity.